If you are in need of the best tents to create a beautiful setting for your wedding, birthday or any other event, we literally have you covered! We have a huge stock of beautiful tents, each 100% waterproof and practical for different types of terrain. When you choose our tent hire service in Kenilworth, be assured that a sunny, windy or rainy weather will not cause you to postpone your event, leaving you worry free! We are determined to make your event a memorable one. Part of this process is to provide a hassle-free service. 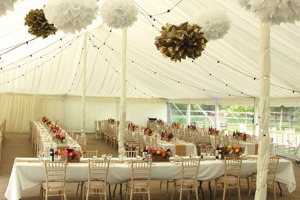 From delivery all through to pitching the tents, our marquee & tent hire company in Kenilworth delivers satisfaction. Whether you’re planning a wedding, garden party, concert or showcase, your guests will be given an occasion to remember, with our beautiful and elegant marquee tents. No matter if you’re event is many months ahead or whether you have an urgent request simply call us and we will oblige. Our enthusiastic team of tent pitching experts is looking forward to make your event a success. Apart from our tent pitching services, we also offer gazebo hire services for small events and décor and drapery services for any event. Whatever your needs be do not hesitate to call our marquee hire specialists on today 021 300 3641!